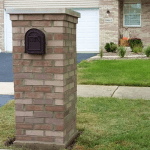 Mailbox Remedies is a mailbox supplier for Naperville that also provides mailbox installation service for Naperville Residents. Whether you use Mailbox Remedies as your mailbox supplier or you decide to purchase a mailbox from another supplier, Mailbox Remedies can install your mailbox. Mailbox Remedies wants to be known as your One Stop, Mailbox Shop. This means you can visit our website, purchase a new mailbox and set up your mailbox installation service without ever leaving the comfort of your home. Mailbox Remedies has provided many popular options for mailboxes and mailbox posts. Follow the links below to browse our selection. Don’t see the mailbox and or mailbox post you are looking for on our website. No worries, Mailbox Remedies has provided links so you can browse all the brands. Just follow the links below. A new page will be opened so you can easily return to the Mailbox Remedies website. When you find a mailbox and mailbox post you like please use our contact us form below for a free estimate. Your estimate will include the desired mailbox and mailbox post along with the cost including installation. In the message section of the form please make sure to provide information about the desired products.